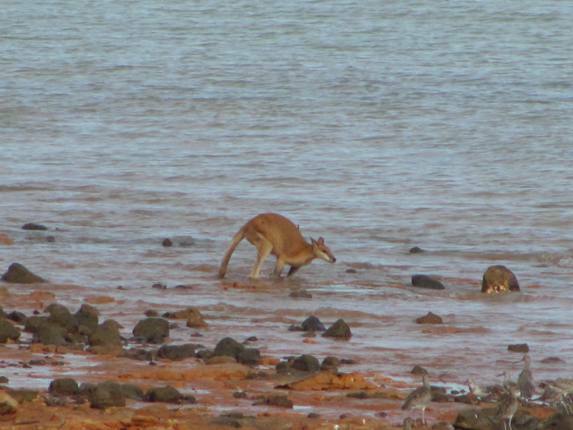 It is not uncommon to see Agile Wallabies Macropus agilis around the Broome area and everyone avoids driving on dusk or dawn as much as possible when they are most active. 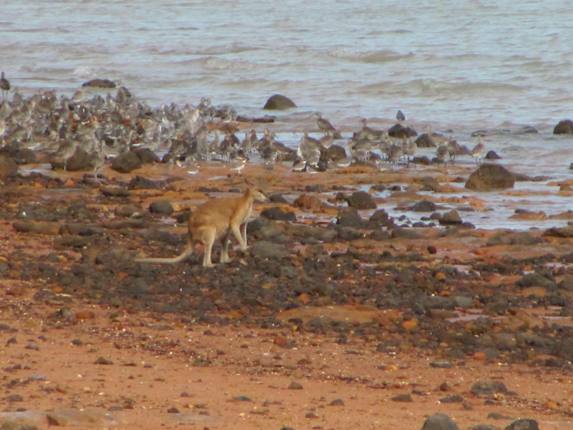 We often see their footprints on the beaches around Roebuck Bay and we have on occasion seen them close to the sea. The male Agile Wallaby weighs in at about 27 kg and the female at about 15 kg. They breed year round and the single young remain in the pouch for about 30 weeks and become independent after a year. They graze on a wide variety of plants and will eat fallen fruit. The other wallaby that is seen around this area is the Northern Nailtail Wallaby Onychogalea unguifera, which is a smaller species. 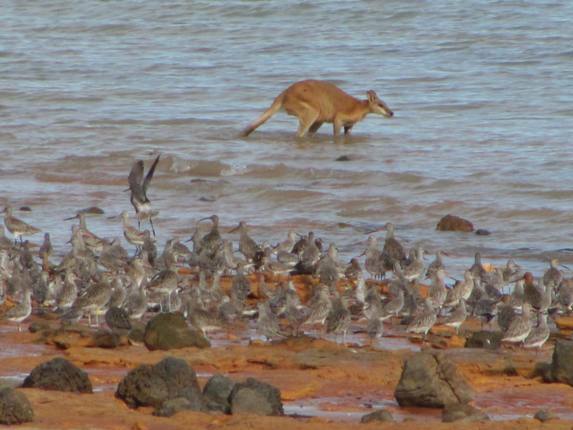 We spend quite a lot of time observing shorebirds in Broome and recently had a great experience where an Agile Wallaby hopped out of the bush at about 4pm and went straight into a flock of shorebirds to get to the sea. Although we were not very close we were able to get some photographs of the event. It appeared to be just going out into the sea to get wet and return to the bush. It was possibly trying to rid itself of ticks rather than cool off. 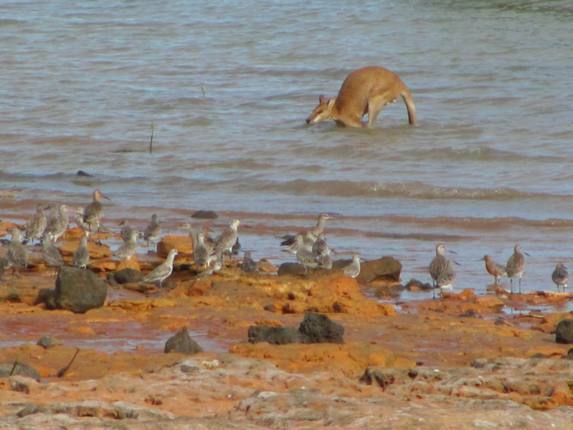 The shorebirds were mainly Whimbrel, Bar-tailed Godwit, Great Knot, Red Knot and Grey tailed Tattler. We recorded a lot of individually marked birds that afternoon and had two flocks of Great Knot head off on their northward migration. 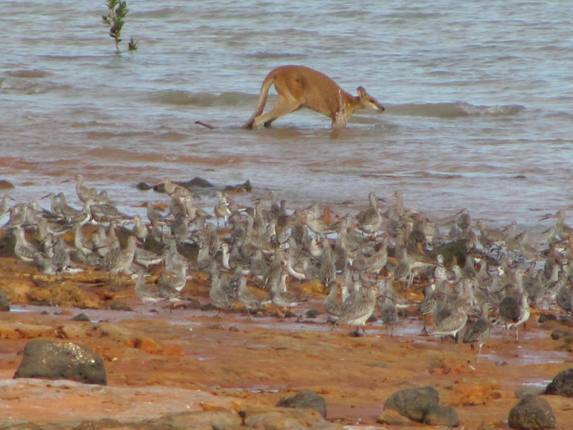 It was rather nice to get a report about 10 days later of one of those Great Knot feeding on a mudflat in Taiwan! I don’t think I’ve ever seen a more apt opportunity to use the phrase “now there’s something you don’t see every day”. I agree, Duncan, and I have to say that I am surprised that this post didn’t get more attention…I mean, WALLABY!!! 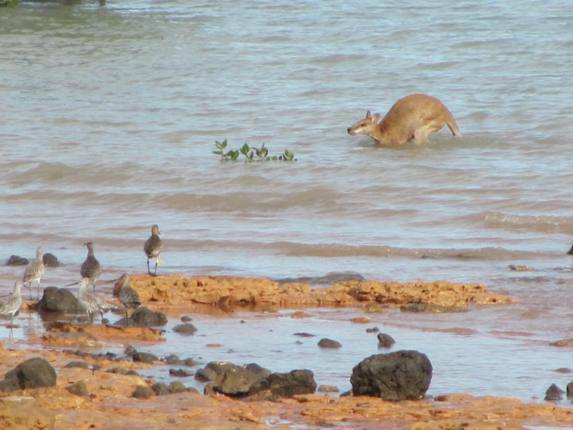 I think a “certain rabbit” is getting more attention at the moment than this wallaby! 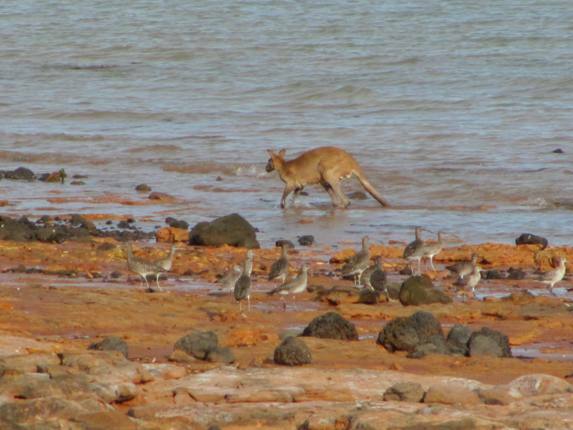 We have seen them do this on a couple of occasions here and we were surprised in Tasmania to have Pademelons lick up our salty pasta water even though we were inland-I guess everything needs salt! Maybe they are common as all heck in Australia, but I thought that Americans love cute creatures with fun-to-say names from down under. You must love numbats then. @ Duncan…YES!!! There’s some great nature-isn’t there?! There used to be Bilby around Broome until about 10 years ago. Feral cats are to blame and it is slowly getting addressed in WA. 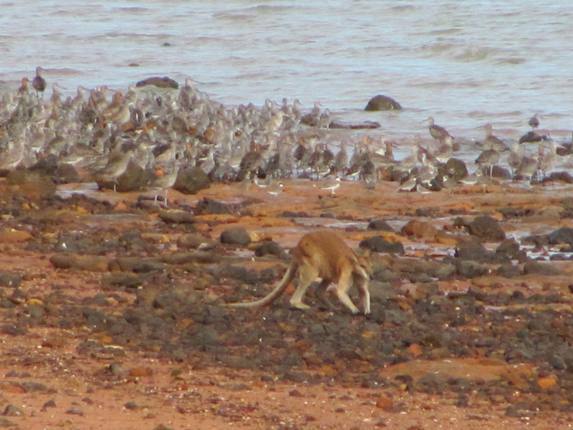 Dirk Hartog Island is going to be cleared of feral cats shortly. They will put a fence through the middle to make it a bit easier to concentrate on two smaller areas. Then they can use the island for endangered native fauna. Oh….what a great ANZAC day dawn service here yesterday-who needs planes to fly over when you have Rainbow Lorikeets-and a great effort by the Pied Butcherbirds in keeping in tune for the National Anthem!